The past has seen a tendency of nations to give up their sovereignty to some unaccountable organizations or contractual agreement frameworks. The EU, IMF, NATO or the WTO are example for such. Afraid of mass imports of hugely subsidized goods from the U.S. and EU, developing countries insisted on their right to put tariffs on these and to protect their local long term food sources from economic ruin. The rich countries tried to deny that right to the poor even while they insisted on subsidizing their exports. The real issue at stake here was the responsibility of a nation to provide for its people. That duty includes their security in a wide sense. Any nation is obliged to take care that it can feed its people from its own soil. The failure of the Doha talks reaffirms this responsibility. The ability to adopt national policies on food production stays with the local people. Everyone who believes in real democracy should welcome this event. It is a win for the sovereigns of the world – its people. The contractual agreements with unaccountable organizations mentioned above have traditionally locked developing countries into crushing cycles of debt. The end of Doha is also a step in the right direction for the environment. Global trade is carried out with transportation that is heavily dependent on fossil fuels. It is estimated that about 60 per cent of the world’s use of oil goes to transportation activities which are more than 95 per cent dependent on fossil fuels. An OECD study estimated that the global transport sector accounts for 20-25 per cent of carbon emissions, with some 66 per cent of this figure accounted for by emissions in the industrialized countries. A derailment of Doha will not be a sufficient condition to formulate a strategy to contain climate change, but given the likely negative ecological consequences of a successful deal, it is a necessary condition. I’m hoping the failure of Doha will help Ghana protect itself a bit more from EU and US agricultural dumping. 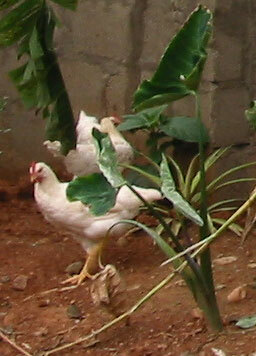 That dumping has made earning money with our small farms extremely difficult. It is difficult to compete with goods that are priced below the cost of production. h/t to Moon of Alabama and the well informed people who comment there. The African Loft has a two part interview with Wole Soyinka and Ed Kashi posted. 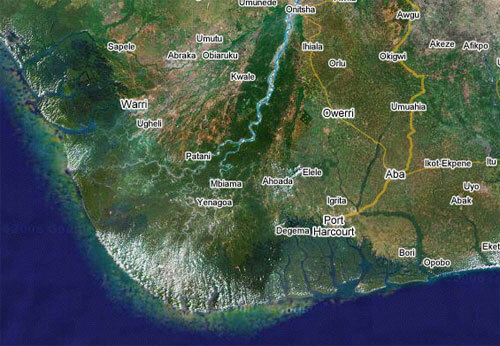 Click over to the African Loft and watch Nigeria: Wole Soyinka and Ed Kashi on Niger Delta. You can click on parts 1 and 2. Kashi just published a book of photos taken in the Delta, Curse of the Black Gold. I ordered a copy and it is an extraordinary collection of photographs accompanied by lots of history and current information. Ed Kashi’s photos are also on display this summer in Rochester New York at the George Eastman House. One thing that struck me going through the book is that the Niger Delta should be one of the most beautiful regions of the world, lush and rich. 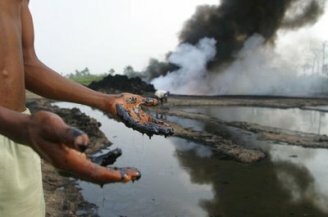 It has been devastatingly polluted, neglected, and degraded by the oil business and the Nigerian government. It costs about $77 in fertilizers and hybrid seed for a smallholder African farmer to produce an extra ton of maize, based on our research at the Millennium Villages. To bring in the same ton of maize into Africa as U.S. food aid costs $670, based on a Government Accountability Office report. Both numbers are as of April 2007 … Since it may now cost an African smallholder farmer about $150 in inputs to produce an extra ton of maize, and she can sell it locally for $250 to $300, the farmer will generate income and begin the economic transformation from sub-subsistence into commercial entrepreneurs. Based on this information, it seems fairly clear what the most effective way to finance food aid is. 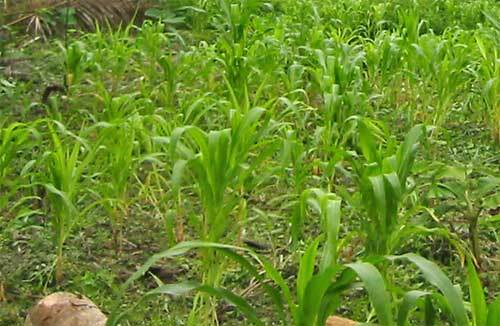 Subsidize seeds and fertilizer for the people who are growing the food locally. And make sure the seeds produce crops with seeds that can be harvested and regrown without paying tolls or tribute to some distant agribusiness imperial power. It is another form of colonial-imperialist agenda to siphon our resources-oil, mineral resources, forest resources and the use of our soldiers to advance their selfish interests. We know they have continuous interest in our crude oil in the Niger Delta region of our country. And believe you me, it will boomerang some day. It will. If you invade a sovereign country for the simple reason that they have what you desperately want, I consider you a terrorist also. First, Yar’Adua should allow the security agencies to do their work, if really he agrees with the rule of law. Because it is only in this country, where someone who does not know anything about oil, but tomorrow he is a captain of the oil industry. They fly the best private jets, and you cannot talk about it. If security agencies are allowed free hand to do their work, honestly speaking, they can nail anybody that breaks the law. AFRICOM: Military Spending Instead of Development Aid? Follow the money. I have a new article up at the African Loft. AFRICOM: Military Spending Instead of Development Aid? Follow the money. Click on over to read it. In practice, the Pentagon is largely dictating America’s approach to foreign policy. The rising military role in shaping U.S. global engagement is a challenge to the next president. Foreign assistance represents less than one percent of the federal budget, while defense spending is 20%. The U.S. military has over 1.5 million uniformed active duty employees and over 10,100 civilian employees, while the Department of State has some 6,500 permanent employees. Although several high-level task forces and commissions have emphasized the urgent need to modernize our aid infrastructure and increase sustainable development activities, such assistance is increasingly being overseen by military institutions whose policies are driven by the Global War on Terror, not by the war against poverty. Between 1998 and 2005, the percentage of Official Development Assistance the Pentagon controlled exploded from 3.5% to nearly 22%, while the percentage controlled by the U.S. Agency for International Development (USAID) shrunk from 65% to 40%. This civil-military imbalance has particular ramifications for Africa, where Global War on Terror imperatives do not address the continent’s biggest needs for security assistance. The U.S. is only helping four African countries transform their armies and security agencies into professional organizations that protect citizens rather than abuse them. Resources are allocated in a manner that does not reflect the continent’s most pressing priorities. 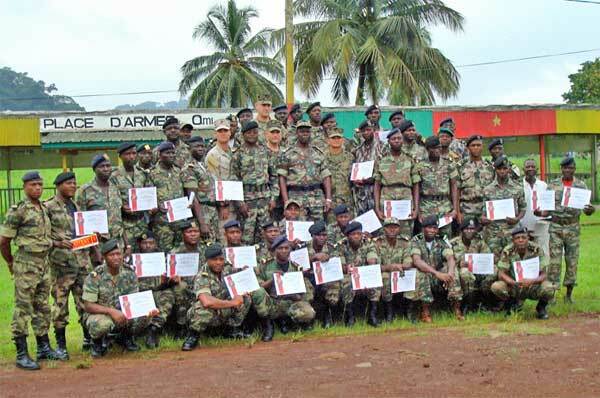 For example, the U.S. has allocated $49.65 million for reforming a 2,000-strong Liberian army to defend the four million people of that country. In contrast, it only plans to spend $5.5 million in 2009 to help reform a 164,000-strong army in the DR Congo, a country with 65 million people where Africa’s “first world war” claimed the lives of over five million people. The U.S. military’s new Africa Command (AFRICOM) is poised to become the dominant influence over U.S. policy on the continent. More funding is needed to address the current 17 to 1 spending imbalance in staffing and resources between defense and diplomatic/development operations, and to reduce the use of contractors in foreign assistance programs. Two case studies emphasize the problems inherent in the U.S. approach. 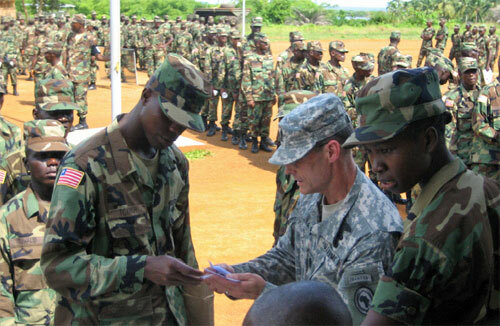 Military dominance over reform programs in Liberia has resulted in a policy focused solely on restructuring Liberia’s army by expensive private contractors, DynCorp and Pacific Architects and Engineers. Meanwhile, intelligence, judiciary, and prison agencies are sadly neglected. In the DR Congo, the State Department has played a very active role in facilitating dialogue among belligerents and is concerned about the humanitarian situation in the east, but the Defense Department is virtually ignoring the nation’s desperate need of military reform. As a result, an inadequately resourced security sector reform program has contributed to the Congolese army becoming a major source of insecurity for civilian communities. Having the Pentagon dictate foreign policy, with AFRICOM poised to become the dominant influence in US Africa policy is precisely the problem with AFRICOM. Add to that the use of military contractors, mercenaries or PMCs, who lack any accountability, and you have a disaster already in operation. That disaster will hurt the US badly, although it will probably hurt a lot more people in Africa. It is what I, and many other people wish to avoid. It is the reason not one African government, aside from Liberia, has welcomed an AFRICOM headquarters on their sovereign soil. As the report states, the Global War on Terror, and I’ll add the US quest for oil, do not address the real security issues in Africa. Asia Times has a story about how Russia is outmanuevering US energy policy in Africa and around the globe. … But what has truly incensed the Bush administration are Gazprom’s dramatic inroads into Africa. 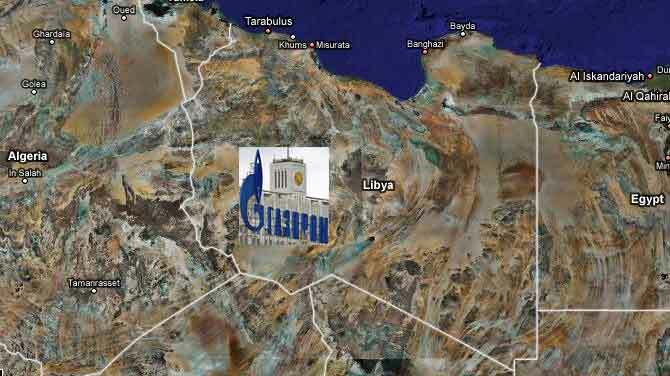 Russian giant Gazprom, the largest extractor of natural gas in the world, has announced plans to build a pipeline across the Mediterranean to pump Libyan gas to Europe. This is the final lap of a Kremlin strategy that involves Gazprom handling the entire output of Libya’s gas, oil and liquefied natural gas (LNG) designated for export to Europe and the US. Look at Gazprom’s terse announcement in Moscow on July 9, “The Libyan side positively evaluated Gazprom’s proposal to buy all future volumes of gas, oil and liquefied natural gas assigned for export at competitive prices.” … Putin visits Tripoli in April, less than a month before he left office, and the two erstwhile colonels decided to jointly handle all of Libya’s energy resources. And Gazprom seeks to buy exploration licenses in Nigeria and proposes to build a pipeline from there to Algeria, and with Algeria, Gazprom is developing a proposal on “joint” marketing of gas in Europe. US officials have gone ballistic. “The monopolistic Gazprom is behaving like a monopolist does. It tries to gain control of the market as much as possible and to stifle competition. And that’s clearly what is going on,” thundered Matthew Bryza, US deputy assistant secretary of state for Eurasian affairs. “The Kremlin wants Gazprom to be a dominant force in global energy, and the dominant force in global gas. Tying up gas resources in Central Asia and Africa is part of that,” he added. The plan is for Gazprom to dominate “in every corner of the planet”, he alleged. This is pretty funny coming from a country that seeks Full Spectrum Dominance (wikipedia definition) of the planet, in large part to dominate the oil markets. It is also pretty funny to hear the representatives of Big Oil, the Bush administration, complaining about energy monopoly. Washington was relieved to see the back of Putin’s presidency, but it now transpires that Gazprom may have only stepped up the pace of overtures under Medvedev’s astute guidance. Besides, with its new assets in Africa, Gazprom will soon be knocking for access to the US market through supplies of LNG. The European and international companies which have been traditionally present in the African market will be compelled to play a role alongside Gazprom. … Gazprom chief executive Alexei Miller suddenly arrived in Tehran on Monday and discussed with Iranian President Mahmud Ahmadinejad the setting up of an organization of gas-producing countries. … During the visit, an agreement was signed on the development of Iran’s oil and gas fields by Russian companies; on Russian participation in the transfer of Iran’s Caspian Sea crude oil to the Oman Sea; cooperation in the development of Iran’s fabulous North Azadegan oil field; and, possible participation of Gazprom in the planned Iran-Pakistan-India gas pipeline project. Evidently, Moscow took a deliberate decision to press ahead with Iran in energy cooperation in the full glare of world publicity in complete disregard of US displeasure. Tehran loved it. … By now it must be obvious to the Bush administration that the youthful-looking, post-communist lawyer-president who took over from Putin has lost no time drilling a hole through the entire US strategy to weaken Gazprom’s grip over the supply of gas to Europe. … The geopolitics of energy security are a highly sensitive subject for the Bush administration, whose profound links with Big Oil are legion. It is a tremendous loss of face for the Bush-Cheney-Rice combine that Moscow is outwitting the US on the energy front. … Although department of defence officials are loath to publicly acknowledge any direct relationship between Africom’s formation and a growing US reliance on that continent’s oil, they are less inhibited in private briefings. At a 19 February meeting at the National Defence University, Africom deputy commander Vice-Admiral Robert Moeller indicated that “oil disruption” in Nigeria and West Africa would constitute one of the primary challenges facing the new organisation. Britain seems to be planning to join in this military approach: Britain to train army in Nigeria to combat delta rebels. Every military ruler of Nigeria trained at Sandhurst, except Abacha. Military training and cooperation does not have a positive history relative to democracy. The UN envoy who was supposed to negotiate with MEND and the rebels in the Delta, Ibrahim Gambari, was revealed to be a close crony of Abacha. It was Gambari who told the United Nations that Ken Saro-Wiwa should be hung because he was “a mere common criminal”. It is therefore a certain sign of the bad faith of Nigeria’s negotiation that they pressed for Gambari to be appointed mediator with the rebels. Gambari has resigned because of the resulting controversy, and plans for talks in the Delta have been suspended. Supporting bad faith negotiation and military bullying will not win hearts and minds, or even control on the ground. The US needs to rethink its approach, especially if energy security remains a US goal. The rebellion in the Niger Delta is not a spontaneous evil, a mindless outbreak of anarchic violence that must be met with still more violence. It is paused by the grinding poverty and economic ruination of one of the most economically productive regions on earth, with the profits channelled to billionaires in Nigeria and to big oil. As the Asia Times article points out, the energy action is global, and the players are big. The US does not necessarily have the advantage. So the US needs to take some of the actual facts into account, and to smarten up its approach.